During the course of September, 2013, the leaders of the G20 nations met in St Petersburg to deal with a number of matters. Pursuant to that meeting, a tax annex to the St Petersburg G20 Leaders’ Declaration was released. At the outset, it is appropriate to point out that the members of the G20 comprise the European Union together with the following 19 countries: Argentina, Australia, Brazil, Canada, China, France, Germany, Italy, India, Indonesia, Japan, Mexico, the Republic of Korea, Russia, Saudi Arabia, South Africa, Turkey, the United Kingdom and the United States. The G20 has been at the forefront of seeking a more effective, efficient and fair international tax system since it declared the era of bank secrecy over at the G20 London Summit held in April 2009. The tax annex points out that in an era of a mobile economy, strengthening of international co-operation in tax matters is essential to ensure the integrity of national tax systems and to ensure trust in governments. The Global Forum on Transparency and Exchange of Information for Tax Purposes has played an important role in creating the international standard of exchange of information on request which was endorsed by the G20 and to ensure that this standard is implemented effectively around the world. The Global Forum has undertaken 113 peer review reports and has issued over 600 recommendations for improvement, with more than 300 of those recommendations having been dealt with. The number of jurisdictions that have committed to implement the Global Forum’s standards and have joined the Global Forum now numbers 120. During the G20 summit held in St Petersburg in September, the G20 has now endorsed the development of a new global tax standard, and that is the requirement of automatic exchange of information. What this means, is that, instead of countries being required to request information from their treaty partners, they will automatically receive information for tax purposes, and, similarly, must make such information available automatically. 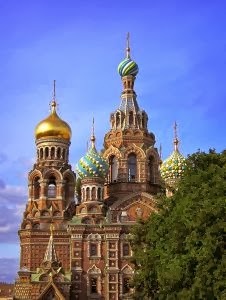 Church of the Savior on Blood, St. Petersburg, Russia. The G20 summit held in Cannes during 2011 agreed to consider exchanging information automatically for tax purposes on a voluntary basis. During 2012, the Los Cabos Summit supported the OECD Report on Automatic Exchange and encouraged all countries to participate therein. The G20 has decided that it is now appropriate to migrate to a more ambitious and higher standard which the automatic exchange of information. This has become necessary as a result of undisclosed foreign bank accounts, and the Global Forum will monitor a move to this standard to ensure its effective implementation. During July 2013, the G20 finance ministers and central bank governors endorsed the ambitious OECD proposal for a global model for multilateral and bilateral automatic exchange of information for tax purposes and indicated their commitment to the automatic exchange of information as the new global standard. The OECD has commenced work with the G20 countries to design a new single global standard for the automatic exchange of tax information. It has been proposed that the new standard, included in a model competent authority agreement, will be presented that the G20 Finance Ministers and Central Bank Governors Meeting, to be held in February 2014. The Global Forum will establish a mechanism to monitor and report on the implementation of the new standard of automatic exchange of information and will co-operate with the OECD Task Force on Tax & Development, the World Bank and other organisations to help developing countries identify their need for technical assistance and capacity building. The tax annex points out that it is anticipated that the automatic exchange of information on tax matters among G20 members will commence by the end of 2015. It has been proposed that the automatic exchange of information is the standard of reporting which will be adhered to by all jurisdictions and which must be adopted in practice. It is anticipated that the multilateral convention is key to ensuring the rapid implementation of the new standard of information exchange, thereby enabling developing countries to develop a new and more transparent environment. It has been confirmed that all G20 countries have signed the multilateral convention and more than 70 countries and jurisdictions are covered or are likely to be covered by the multilateral convention, including a large number of financial centres. It has been pointed out that the multilateral convention is a powerful tool to be used in combating tax evasion, and allows for all forms of co-operation tax matters, including the automatic exchange of information. Recently, the OECD issued a document dealing with the manner in which countries should address base erosion and profit shifting (‘BEPS’). The tax annex points out that international collective efforts must also address tax base erosion flowing from international tax planning. The G20 has pointed out that the interaction of different tax rules which may result in multinational enterprises to artificially shift profits out of the countries where they are derived resulting in either very low taxes or even double non-taxation needs to be addressed, as this undermines the fairness and integrity of the various tax systems around the world. G20 leaders, during the course of their 2012 summit, identified the pressing need to address BEPS as a priority and that it is important to achieve better international co-ordination on taxes. Furthermore, the tax annex refers to the fact that the rules regulating international tax, which were formulated in the 1920’s, have not kept abreast with the dynamic need to address BEPS as a priority and that it is important to achieve better international co-ordination on taxes. Finally, the tax annex points out that it is intended that developing countries must reap the benefits of the G20 tax agenda, thereby enabling developing countries to secure tax revenues required to foster long-term development. Thus, based on the decisions taken at St Petersburg by the G20 summit, it is intended that the countries comprising the G20 will, instead of only making available tax information upon request, be required to automatically exchange certain tax information to the G20 countries. In time, it is anticipated that the requirement to automatically exchange information will increase amongst the various countries of the world. South Africa currently has a large network of double taxation agreements in place, which contain articles dealing with the exchange of information from South Africa to the treaty partner and vice versa. In time, these articles will, no doubt, be amended to comply with the decisions taken at the St Petersburg G20 summit. Furthermore, South Africa has concluded a number of tax information exchange agreements, a number of which are already in force, particularly with the Bahamas, Bermuda, Cayman Islands, Gibraltar, Guernsey, Jersey and San Marino. A number of other tax information exchange agreements are in the process of being completed and will come into force in the next twelve to twenty-four months. In addition, South Africa signed the Multilateral Convention on Mutual Administrative Assistance on Tax Matters as amended by the protocol in Cannes on 3 November 2011, and, once the outstanding formalities have been completed, that convention will, for all practical purposes, constitute part of South African law. Taxpayers, therefore, need to be aware of the changes taking place in the international arena whereby tax authorities will exchange information automatically from one country to another to ensure greater compliance with the tax systems around the world. This article by Dr Beric Croome Tax Executive Edward Nathan Sonnenbergs Inc. was first published in Business Day, Business Tax and Law Review, October 2013.